In wikipedia I found a probability of accident (fuel melting) for the first generation of nuclear plant : 5 / 100,000 per reactor and per year . 7/.65= 10 times the probability given. The 13,000 years include also the most secure nuclear installations. That is why I believe we have got to find a solution that works in the worst case: the loss of everything but a reactor about to explode in its confinement : no staff, no electricity, no cooling (no water, no air),even the gravity might not be completely usable because the reactor might lose its horizontality. If we decide to achieve such a security target then we might find that nuclear corporations are a good investment. Oil price would rise accordingly. They still need to work a little, to involve a lot of people in the research. "c'est Mélanie qui lui fallait"
(La mélanie en question est peut-être une prostituée spécialisée dans le triolisme). Dans un autre commerce j'achète le journal après avoir dit poliment bonjour. Un client en train de payer: "Il est fou"
Réponse de la commerçante: "Il faut continuer, il aurait retrouvé"
cette volonté de vouloir à tout pris me tutoyer et de se comporter comme si j'était son copain, tout en se foutant ouvertement de ma gueule. A part cela je me demande comment j'ai pu consommer 140Kwh en environ 24h? Je ne vois qu'une seule explication: erreur de relevé. Pas d'eau chaude. Deuxième partie du poste moussé en une seule fois. C'est la troisième fois. Rechercher des livres pour s'instruire. Ce n'est pas la première fois que j'essaye de trouver un livre sur le site de la BNF. J'ai abandonné à plusieurs reprises. J'avais entendu dire que l'on pouvait se faire livrer les livres chez soi pour consultation. Essayez par exemple de chercher des livre sur les trou noir en utilisant le moteur en ligne de la BNF et le moteur Google, comparez le résultat, le prix qu'il faut payer, le temps passé. Personnellement je préfère acheter sur Amazon après avoir cherché sur Google. En prenant de l'occase il n'est pas sûr que cela coûte plus cher. On devrait pouvoir chercher de chez soi aussi facilement qu'avec Google et aller chercher le livre à la bibliothèque du coin. Quelle liste de livre (adaptée à un public donné) existe dans les bibliothèques pour pouvoir améliorer ses connaissances de base dans un domaine donné? De telle listes devraient exister dans chaque bibliothèques même les plus humbles. Again about nuclear plant safety. This is extreme temerity for some body like me to speak about that subject. I hoppe you will excuse me to have done it in spite of my very low knowedge in the nuclear field. Although it's better to try to have one evaluation than nothing , my problem is the way our specialists are reckoning the risks we incur. Is it temerity to pretend to give a risk evaluation? Lack of water for some plant nears rivers (because of tectonic faults). Destruction of water pipes in charge of cooling for the same reasons. Lack of air in case of air colling. (why not). Destruction of all electrical installations. Destruction of the staff in charge of the plant. No cooling, no staff, no electricity, no backup, nothing. In this case, we might want a solution that would work automatically. That's why I thought in my posting after Fukushima about a solution using gravity to expel the fuels rodes from the core. To isolate and to cool them. To stop the nuclear reaction to it's minimum. To return to the state they were berfore entering the core. Perhaps it would be easier in this new location. If there is a container at the end of the tube then it might be possible to separate it from the core and to continue to cool it somewere else. The best solution being: to let them cool alone without having to act. How could we release automatically the fuel rod? Perhaps using an ergot that melt automatically before the rod itself melt. 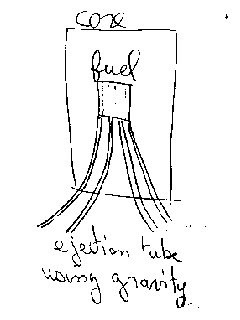 The melted ergot will let the fuel-rod fall. What if the core start to melt? Using tubes at the bottom of the core. Eject the melt with the help of gravity. But what could we use at the end of these tubes to recieve spread and cool automatically the melt? Sand? Perhaps such solutions are allready used in the new nuclear plants. Perhaps they are dangerous solutions or simply not possible. Do they? We have the right to know more precisely. Particularly I'd like to know what will happen if nothing is left to manage, scrutinize and cool the reactor. I hope again that you will excuse me for pretending to find simple solutions when courageous people are being intoxicated, risking their life and health to restore a normal situation at Fukushima nuclear plant. Il y a encore quelques résistants mais je ne désespère pas. -- En arrivant sur le parking un ouvrier. Je site: "Mais pour qui il se prend? Vous ne serez pas pris". Je suppose qu'il parle de la candidature que je vais envoyer. Mais comment sait-il ou je vais l'envoyer? Peut-être une atteinte à la vie privée. J'en profite pour dire que cela n'est pas la première fois que je reçois la primeur d'une réponse à une candidature par des personnes croisées dans la rue. Cela doit être une tradition dont certains sont fières. --Par exemple en caisse cet après-midi: une femme et son enfant. Je site: "Il aurait retrouvé, il faut continuer, on continue". Je fais ce commentaire: Si le type devient violent s'est bien, mais s'il devient violent avec des femmes, des personnes âgées ou des enfants c'est mieux! Fukushima and Nuclear Plant Safety. -- This accident may have a big impact on the french economy. Because of the cost we might pay to improve nuclear security. -- Why they don't have helicopteres equiped with an automated pilote? Or why they haven't built helicopteres with a shield against radiations ? They could go near the reactor without risking life of pilotes. In this case, they could have put water more accurately in the pool with used fuel. This solution could have been decided just after Chernobyl. -- When making the conception of the plant: why they haven't found a way to be able to stop the reactor even if cooling has been stopped? I mean: is there any way to spread the fuel far enough or to eject it out of the reactor-core so it would stop to interact and heat? Do they need to cool the fuel when they carry it from La hague to Japan? -- Because cooling is critical then why they don't have a backup outside the site for the pump and the electric power: that equipment could be transported by an helicoptere. -- Why they don't use every year students working in this area? They could make propositions and critics about the conception of a nuclear plant. Somebody in charge of designing a nuclear plant might have difficulties to find every case of disaster. Once you have missed the point, you are likely to miss again. We can't wait that the disaster comes. -- Do we have too many possible causes of disaster? That would be dreadful if we could not protect ourself efficiently against nuclear disaster . It may be possible to find some solution that might be common to many causes of disasters. The most obvious being of course: not using nuclear plants. -- Japanese executives of the nuclear corporation might have made bad decisions in order to save money. In this case citizens might want to include in the staff that is managing the accident, people who are less interessed in the profit of the corporation: members of governmental organisations or members of the army. Equipments and people that do not belong to the corporation might also be used to monitor constantly the daily events at nuclear plants. -- We have to considere that security and cost are always fighting each other. Whatever cost we want to cover we will always have security problemes when designing a nuclear plant. We have to choose: either we spend more in order to avoid accidents or we spend more to manage the accident. -- I see an other issue related to economic war between states. If a state decide to spend a lot of money in case of accident in order to protect it's own population (and that include population in other states as well) it might encourage other states to provoke such an incident in order to win economic competition. We could ease this problem by giving more authority and more means to an independet international organisation in charge of nuclear security. -- Environmental activists are upset. They will not miss this opportunity. But I am asking them to reckon how many people have died in car accident since the start out of using cars. For exemple how many people would have been saved if they had been wearing an helmet inside cars? These activists would probably agree that our leaders have still space for more casualties in the nuclear field. One of the biggest problem might be the using of fuels like MOX (around 7% of plutonium). The life-time of radiations is 24000 years in case of plutonium. That is not a nice gift for the next generations. After several big nuclear disasters involving plutonium, they would have to stick with their geiger counters. With such a life-time we might get some environmental achievements: restore the life of some dinosaurs just by accelerating the Darwinian evolution! -- An other question: will they continue to use MOX in the oldest plants, the ones which have the highest risks? Aujourd'hui c'est la première fois en 10 ans que j'ai pu entrer dans le supermarché du coin sans avoir droit à des réflexions de la part du personel. Est-ce à cause du blog ou de la plainte que j'ai déposé? Ou alors des dyslexiques ont-ils compris et informé la police? De plus en plus de gens me font savoir qu'ils sont comme moi, j'ai parfois des surprises. Ceux qui ont changé d'attitude ont compris que je ne suis pas le nanti qu'on leur a décrit. Un jour, j'ajouterai peut-être à mon dossier professionnel sur internet une partie comprenant mon dossier médical. Il faut attendre pour voir si le climat a véritablement changé. Cela fait des années que je bosse dans les usines à faire du travail parfois pénible. Dernièrement c'est le nettoyage agroalimentaire: jouer avec les jets haute pression, escalader les tapis, trieurs, pousseurs, concasseur . Se décaper les poumons avec les vapeurs de chlore. Se rincer les yeux suite aux projection de soude et autre produits corrosifs. Pousser une auto-laveuse dans un super marché? Me présenter aux prochaine présidentielles? Faire des massages dans une maison de retraite? Jouer les robots sur une ligne de production? Danser avec les jets haute pression? Il faut que je choisisse pour mettre au point une stratégie conquérante en accord avec mes capacités, mes goûts et le marché. C'est pas facile à mon age. Les options se sont sérieusement réduites. Vous n'avez pas une idée s'il vous plait? Il faudrait que je puisse continuer jusqu'à 65 ans. On me conseille d'envoyer des cv un peu au hasard pour voir. Moi ça me fait rigoler: déjà les chances d'avoir un retour sont mince quand vous avez quelque chose de concret à offrir alors que dire si vous y allez au petit bonheur la chance? Supposons que je puisse à nouveau travailler dans l'info, le bricolage informatique à la maison serait finit à moins de vouloir devenir fou. "Il ne veut pas travailler": S'il a quelque chose à me proposer qui soit mieux que ce que je fais actuellement (10heures le Samedi plus quelque petites missions d'intérim ), alors qu'il le fasse publiquement sur ce Blog. Il est ouvert à tous. J'accepterai, même s'il me propose la direction informatique de la SNCF, ce qui étant donné mon cursus montre bien toute ma bonne volonté. Ils n'ont plus besoin de lampiste? C'est bien ce dont je me doutai, je suis resté 15 ans en arrière. Quoi? Ils voulaient vraiment se débarrasser des types? Comment?.... Je suis un looser?! "Vous êtes tout excusé": C'est ce que je pense aussi , si je m'excusais alors une nuée de personnes qui ont dit n'importe quoi sur moi seraient obligées d'en faire de même. Cela serait difficile à organiser. Mieux vaut en rester là. "C'est pas vrai, c'est vous qui les avez contactés en premier": Mais comment sait-elle la conversation privée que j'ai eu cet après-midi au téléphone? Ah j'avais oublié! Cela doit être pour cette raison qu'on m'a dit une ou deux fois:"Tout ce sait en Bretagne". Moi j'ai surtout remarqué que comme ailleurs tout ce dit. Aujourd'hui (1 Mars 2011) j'ai fait ma petite ballade quotidienne et quelque courses. Si j'en parle c'est qu' elle se passe de cette manière depuis une quinzaine d'années. "Si vous balancez un agent vous vous faite tuer." "Si vous sortez avec un avis de coup de vent vous vous faite vider." "Si vous refusez vous serez radié." J'en profite pour mentionner que j'ai un CDI à temps partiel. Cela fait 4 personnes: c'est la moyenne depuis 15 ans pour un passage pas très fréquenté. Si je vais en ville comme à Quimper cela monte facilement à 15 personnes. Avant cela montait à 10 - 30 personnes pendant des périodes de conflit. Le maximum étant environ 100 personnes dans une journée. Enfin je ne dois pas me plaindre cela c'est plutôt amélioré. Il y a aussi les problèmes d'atteinte à la vie privée. Mais je vais faire un message spécial pour cela.